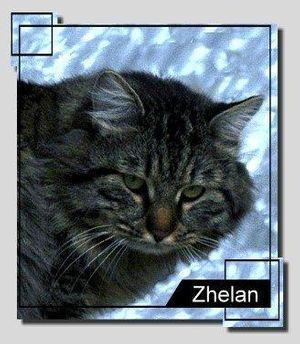 Beginning in 2006, we began investigating the how to's of finding and importing 100% pure foundation Siberian cats from eastern, rural Russia. 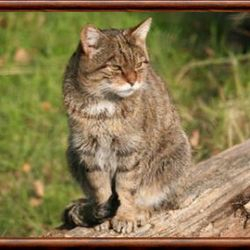 By 2009, we had invested a lot of time and effort with several other Foundation line breeders to identify and import these vigorous aboriginal Siberian cats from unused or rarely used lines. Since this time we have brought in several aboriginal line Siberian cats (pure Siberians, some with parents directly "from the fields"), from eastern Russia. Our Aboriginal Siberians are healthy, large, and their lines are rarely or not at all seen in the north American pedigrees. Working with the aboriginal Siberian cat, we help expand the limited genetic pool of breeding and pet Siberians currently available in North America. A wide genetic pool is important. 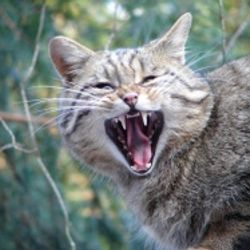 When Breeders breed and re-breed within a limited genetic pool, they increase breed-wide incidences of heart, kidney, and other genetic diseases, as well as create less effective immune systems for their cats. Weak immune systems are one of the causes of FIP. In committing to breed Siberian cats, ethically we had to focus on protecting breed health, as well as preserving the original wild look and massive size of the aboriginal Siberian cat. 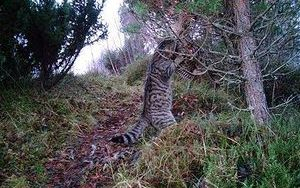 This photo is of a Scottish wild cat (Felis silvestris grampia). Note the massive size of the cat compared to the tree. This is Zhelan Manchzury on 28 January 2013. 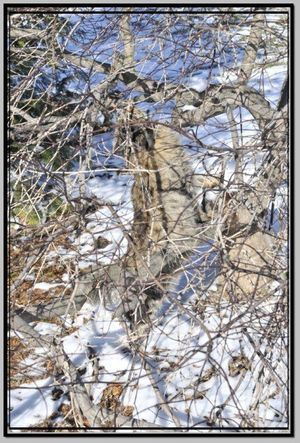 Note the striking similarity to the felis silvestris grampia in the same position in the photo above. 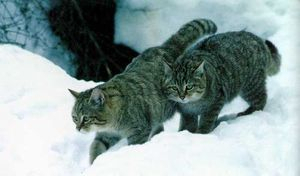 Siberian cats from eastern Russia are widely known to have outcrossed with the felis silvestris wild cats. The size of a Siberian feral male is quite large, typically 20 to 25 pounds. Their temperaments are wild, and would be unsuitable as pets. Over hundreds of years Siberians became the farmer and woodsman's ally - keeping rodents at bay and even providing company. Over time Siberians who elected to remain close to human settlements self selected for traits of affection, lowered aggression, and a smaller size. 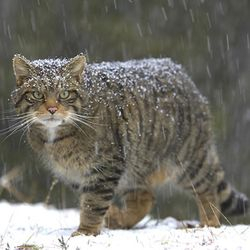 Today the typical eastern Russian Siberian male is a large domestic cat weighing between 15 and 20 pounds. As the breed moves westward, size has decreased and most show standards indicate a weight of 11 to 13 pounds for the fully adult male. 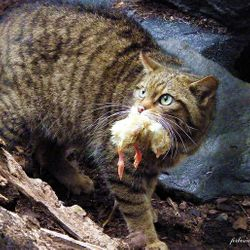 Although there are those who insist that mating between feral and wild cats is impossible, not only is it documented, but these mixes risk the continuation of the truly wild cats. 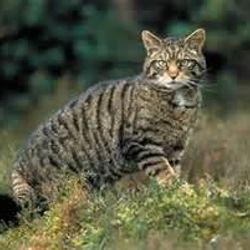 By far the greatest threat to the European Wildcat is that of hybridisation. 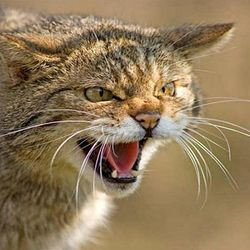 Although many of the wildcat sub-species live in remote regions, many live in relative close proximity to human habitation and (therefor) close to domestic and feral cat populations. 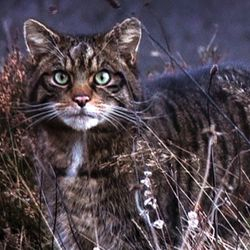 In these areas wildcats often mate with domestic and feral cats and over an extended period of time it is possible that certain sub-species will simply 'breed' themselves out of existence. 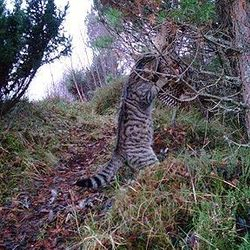 Recent research shows that of all the Scottish wildcat and feral populations as few as one in eight are pure bred 'wildcat' with the remaining hybrids ranging from close wildcat to almost pure feral/domestic. In the light of this F.silvestris grampia has been listed as Endangered by the IUCN. By choosing the aboriginal Siberian cat, we sacrifice the glory and glitz of show wins for the betterment of our beloved breed. 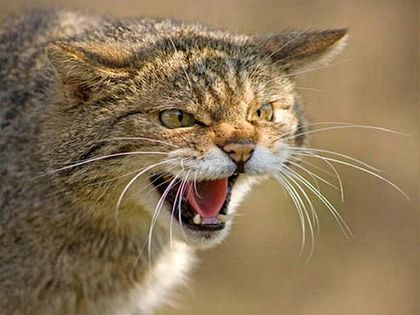 Our slideshow, below, is of wild cats. Don't they have an amazing similarity to the photos of Zhelan Manchzhury, above? It's no mistake. Zhelan's mother Vasilisa is a foundation Siberian Queen directly from the fields of eastern Russia. Our dream is to someday visit Russia to meet Siberian breeders, but even more importantly to learn about the country. We thank the breeders who partner with us to help us focus on preserving this unique large, loving cat.